18th February 2010. Special 200th Edition, New Poll, New Tech Strip Lights, New Article - Trailer Wiring Diagrams, and 2 New Treks - Gregory NP and Toolinna Cove. You may recall our recent poll asked "Which ExplorOz sticker would you place on your vehicle?". It was clear almost from the beginning that the original round design was favoured and by the end of polling, almost 50% of respondents voted "round". We've responded to your feedback and have returned to the original round design. All shop orders have been going out with a free round sticker now for about a week. Ournew poll starts today and asks for your thoughts about travelling the region known as the The Explorer Highway (Way), which links the journey between Alice Springs and Adelaide. ExplorOz has offered to support current research being conducted by the tourism industry together with businesses in the region. Your response to our new poll will assist in providing some baseline information for the project. 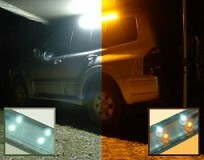 Did you know that insects aren't attracted to the yellow light spectrum? That's why this new product is exceptional. The Twin Duo (Yellow or White) LED Strip Lights have 40 of each colour LEDs, that’s double the amount of LEDs of the standard Duo 90 Strip Lights. At approximately 2 cm wide and 90cm long they can be fitted into very thin, unobtrusive locations, and are ideal for use in camper trailers, caravans, tents, vehicles, boats, yachts and horse floats, they are especially effective when used under vehicle awnings. For the brightest white light output, we also have the new Twin 90 Flex White LED Strip Lights with two rows of bright white LEDs. Treks in the far North to the far South!!! Starting at Balladonia Road House, this trek leads travellers across vast, almost treeless, grasslands of the Nullarbor through thickly wooded areas to Toolinna Cove. 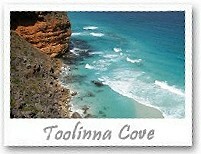 On the way, explore Five Ways Well, sink holes, ruins of a telegraph linesman’s hut, rock holes and a tank, before reaching the spectacular 75 metre high Baxter’s Cliffs at Toolinna Cove. 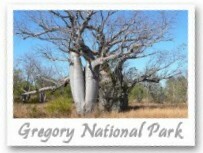 We are concerned at the number of people who have put their names down to attend the 2010 ExplorOz National Gathering. The host venue cannot cater for excessive numbers so we need to know if alternative camping arrangements are necessary. Please help us plan this event by removing your name from the list unless you are committed to being there. Go to the 2010 National Gathering page and press the 'Unable to Attend' button. Live in a community of like-minded people in a thriving lifestyle location - RV HOMEBASE Fraser Coast. Store your motorhome / caravan undercover at home (link to services for extra living space). Features like hi-tech van wash bay & Happy Hour Hut combine with $3m in facilities to create a warm & welcoming community. Opportunities exist to invest in a high growth industry and share in the whole project (5300 web visits in 1st month), & for residents (also ideal combined lifestyle / investment and for sms funds). Call 1300 391 711 or www.rvhomebase.com.au for Prospectus. Conditions apply. Southern Sydney Radio Communications is a small family run business specializing in the sales and service of 2 way radios for a large variety of clients. RV Homebase is an active lifestyle community for RV owners, grey nomads & adventure loving friends. Our newsletter is distributed to 41,349 subscribers on a fortnightly basis.